Lortheim is a Nord priest who lives and works in Windhelm at the Temple of Talos with his wife, Jora. Lortheim spends his entire life inside the Temple, and sleeps next to his wife every night between midnight and 8am, interrupted only by a one-hour breakfast at 6am. He then drifts around the Temple hall all day long and only stops for a one-hour dinner at 6pm. Despite what his wife claims, he never sets foot in the Palace of the Kings (see bugs). He wears blue mage robes and a pair of boots. He wields an iron dagger in combat, and carries some common loot and gold and hooded monk robes. Lortheim is a dedicated follower of Talos stating, "I've spent my life serving Talos. I don't plan to stop now, no matter what the Empire says." He continues to offer his opinion on the ban of Talos worship: "Talos created the Empire. You'd think they'd show him more respect." He hopes that one day the ban on Talos worship will end, stating, "Someday all of Skyrim will worship Talos openly, as we do here." 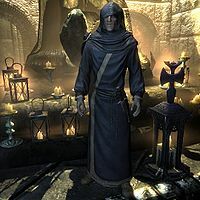 If you side with the Empire during the civil war quests and kill Ulfric Stormcloak, Lortheim will question the future of Talos worship: "With Ulfric dead and the Stormcloaks gone, who will have the courage to champion the cause of Talos?" When at the Candlehearth Hall, Jora may wrongfully complain that Lortheim spends most of his time in the Palace. This, however, is not true as Lortheim lacks the appropriate packages. Lortheim was supposed to sleep until 8am, but his one-hour breakfast at 6am always takes precedence. This page was last modified on 7 May 2014, at 03:39.